Here is a review of the Haan HS-20 “tea pot” style steamer. These low capacity steamers are pretty handy to use and have a lower cost than some of the “wheeled” units. 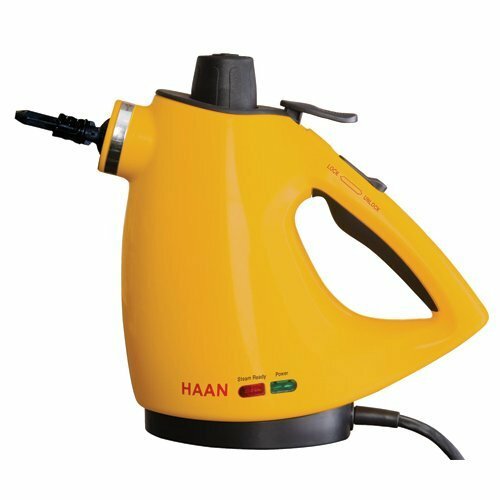 Haan is a Korean company that makes a few different steam cleaning machines. The HS-20 is the number one selling tea pot style steamer currently on amazon so that has got to tell you something. First off, the instructions leave a little to be desired. They are a bit vague along with looking like they were translated by a machine. If you’re familiar with the term “Engrish” you’ll know what I mean. But alas, it’s not too complicated. Simply fill the unit,turn the cap to get it locked down securely and let the little mini “pressure cooker” heat up. Remember that this is not the world’s biggest unit, so try and conserve your steam. Some people have the tendency to hold the trigger down continuously causing it to run out fast but this is usually unnecessary. You’ll still have to wipe what you steam. So steam, wipe, steam, wipe – seeing how much is left as you go along. Works great on the stove top, underneath the fridge, around the toilet seat, yard kids toys and the high chair. Anywhere you might not want to spray with chemicals or in nooks and crannies you just can’t reach. 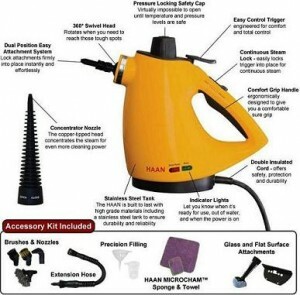 The steamer blows out dirt from hard to reach places (toilet seat hinges anyone?). Remember to use the various brush attachments to help you scrub. You’ll need more than steam to clean the stove top, the steam loosens the dirt and the brush helps scrape it off. The unit is no miracle worker, but works as advertised giving a about 10-15 minutes of steam. Considering the cost at about $60 on amazon I feel you’re getting your money’s worth. For a little more power I would consider the McCulloch MC 1275 steamer at around $80 which I’ll be reviewing shortly.